Quarter Amish Farm is owned by Russell and Liz Beiersdorfer. Guiding principles directing the farm mission are in providing opportunities for people of all ages to experience and learn about responsible agriculture. Visitors may pick and purchase chemically-free grown blackberries, experience nature, observe livestock, and learn about growing and preserving garden bounty. Russell holds a degree from Purdue University in Horticulture and Ag Economics and has over 40 years experience growing fruits and vegetables; recently focusing on brambles. Liz holds an associate degree in Veterinary Technology, Bachelors of Music Education, and Masters of Education. She has over 35 years experience raising livestock, growing vegetables, preserving garden bounty and practicing self sufficiency arts and crafts. Using farm resources she makes goat milk soap and soft goat milk cheeses including ricotta, mozzarella and feta. Liz believes in relying on Nature when possible and living a simple lifestyle. As an educator for over 25 years, Liz loves to share knowledge with others whenever possible. What does Quarter Amish Offer? U-Pick Red Raspberries are available from mid June through mid July. 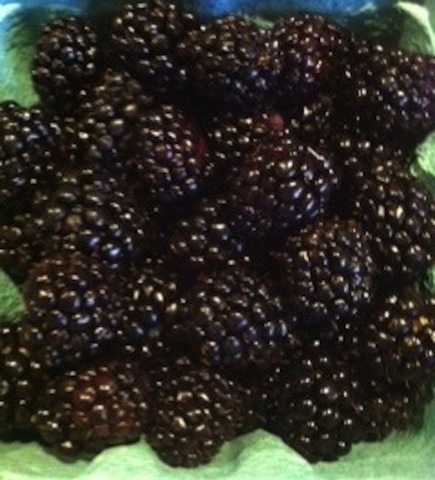 U-Pick Blackberries seasonally from July through September. Pre-picked orders may be placed by phone, email, or in person. Garden produce, may be offered for sale upon availability, as well as, goat milk and olive oil soap, and shea butter lotion bars. Workshops are available for soap and natural cleaning product making, animal husbandry, fruit and vegetable gardening practices and food preservation. Feel free to bring your own shallow picking containers; however, containers are available upon request. Berries are sold by the pound for U-Pick and already picked. Cash, checks, and Credit Cards are accepted. Please dress appropriately for warm weather and wear shoes which cover the feet. Berries are fragile and Must be used immediately, refrigerated for a few days before use, or preserved by freezing, canning, or dehydrating within 24 hours. It is prudent to call for berry availability, especially if traveling several miles to visit the farm. “Easy picking” rain or shine under the high tunnel. Phone: 812-584-8193 or leave a message at 812-623-2803. Follow QuarterAmish on Facebook or Twitter for updates. Please let me know when the berries are in … would love to come pick some. Red Raspberries are currently in season. Blackberries will be available after the fourth of July. Thank you. Yes I do have blackberry vinegar syrup. It is $5 pint. I will be coming to Columbia City for July 16th. Perhaps we could meet somewhere. I am so happy you checked back with us. Looking forward to hearing back. What is your location? Are you open for berry picking? We are located at 24611 Van Wedding Road, Sunman, IN 47041. Currently we are picking thornless blackberries.